Scribner Book Company, 9781501124716, 336pp. This unforgettable debut, set against the dramatic Antarctic landscape, is "refreshingly different, vivid and immediate. Midge Raymond has an extraordinary gift for description that puts the reader bang in the middle of its dangerous and endangered world" (M.L. Stedman, New York Times bestselling author of The Light Between Oceans). It is only among the glacial mountains, cleaving icebergs, and frigid waters of Antarctica that Deb Gardener and Keller Sullivan feel at home. For a few blissful weeks each year they study the habits of Emperor and Adelie penguins and find solace in their work and in one another. But Antarctica, like their fleeting romance, is a fragile place, imperiled by the world to the north. Each year, Deb and Keller play tour guide to the passengers on the small expedition ship that ferries them to their research station. But this year, when Keller fails to appear on board, Deb begins to reconsider their complicated past and the uncertainty of any future they might share. Then, shortly into the journey, Deb's ship receives an emergency signal from The Australis, a cruise liner that has hit desperate trouble in the ice-choked waters of the Southern Ocean. Soon Deb's role will change from researcher to rescuer; among the crew of that sinking ship, Deb learns, is Keller. As Deb and Keller's troubled histories collide in this "original and entirely authentic love story" (Graeme Simsion, author of The Rosie Project), Midge Raymond takes us on an unforgettable voyage deep into the wonders of the Antarctic and the mysteries of the human heart. 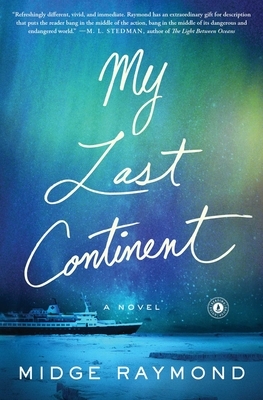 My Last Continent is "a sensitive exploration of how the smallest action can ripple through an ecosystem--seemingly impenetrable, but as fragile as the human heart" (The Minneapolis Star-Tribune). "Atmospheric and adventurous...The story and vivid writing will keep readers glued to the pages" (Library Journal).